Video courtesy of the NOAA Office of Ocean Exploration and Research, Gulf of Mexico 2017. Download larger version (mp4, 119.2 MB). 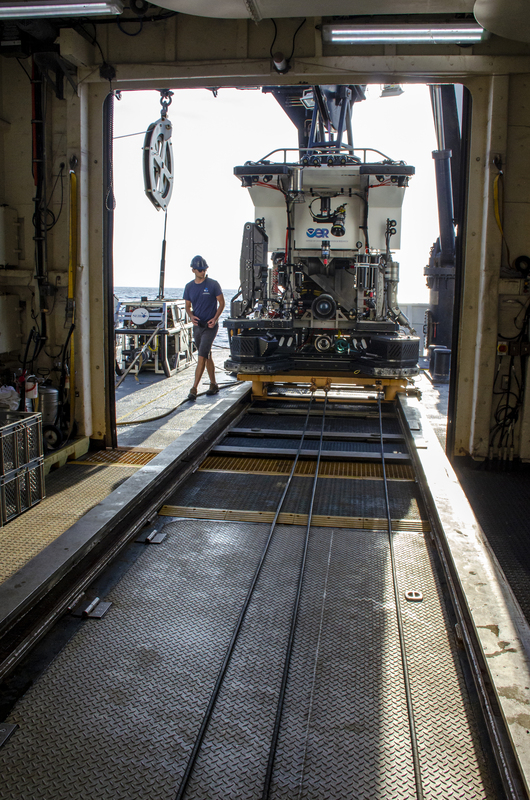 Remotely operated vehicle (ROV) Deep Discoverer is owned by the NOAA Office of Ocean Exploration and Research and was built and continues to be maintained and operated by the Global Foundation for Ocean Exploration (GFOE) . Also known as “D2,” the vehicle is operated off NOAA Ship Okeanos Explorer with its sister vehicle, Seirios. 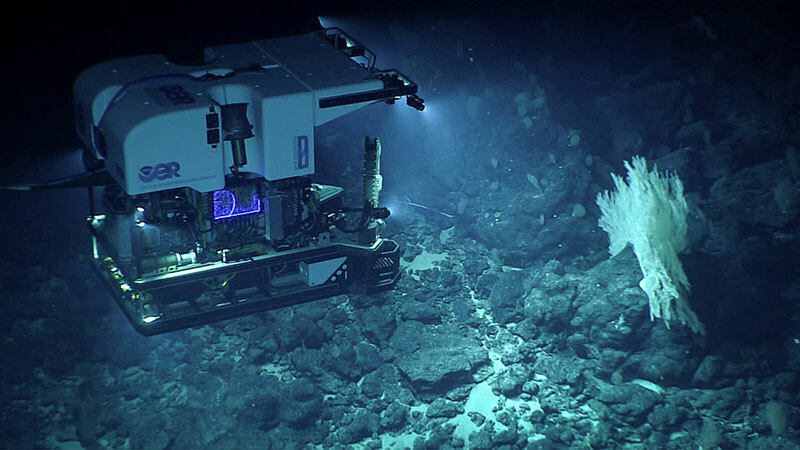 Capable of diving to depths of 3.7 miles (6,000 meters), D2 provides scientists unprecedented access to the deep ocean. The main capability of Deep Discoverer is the ability to capture high-definition video, with the vehicle’s primary camera able to zoom in on a three-inch long organism from 10 feet away. D2’s 20 LED lights provide 150,000 lumens of light, illuminating the otherwise dark depths of the ocean. Equipped with two manipulator arms, Deep Discoverer is capable of collecting both biological and geological samples. 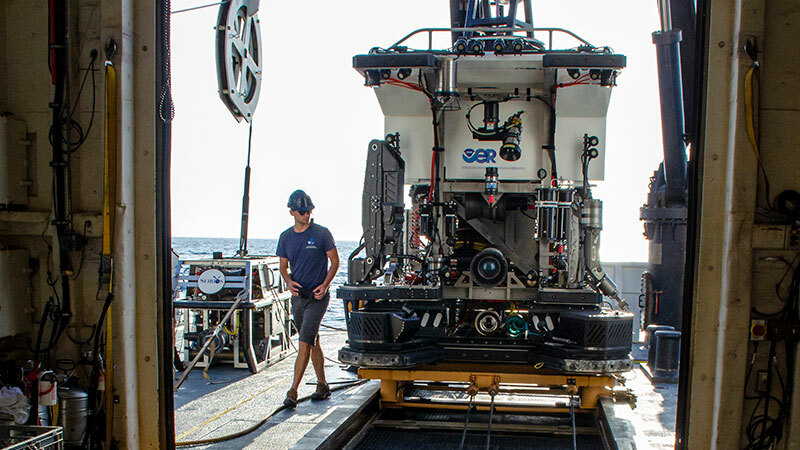 The ROV is also outfitted with a variety of sensors to measure parameters such as salinity, water temperature, depth, and dissolved oxygen, providing additional information about the deep-ocean environment. Also available are five 1.7-liter Niskin bottles for water collection and a rotary suction sampler with six 4-liter sample jars for collecting more delicate biological samples. As a “remotely” operated vehicle, D2 carries no passengers. The vehicle is connected to Seirios and Okeanos Explorer via a long cable and is piloted by GFOE engineers on the ship. Thanks to telepresence technology, live video from D2 travels from the seafloor to the ship and then via satellite connection to scientists located on shore who use the real-time video to provide guidance to the pilots on where to go and which samples to collect. The live video is also broadcast to the Internet, allowing members of the public to join in on D2’s adventures. From delivering stunning high-definition video and gathering physical data about surrounding waters to allowing the collection of biological and geological samples, D2 is delivering data needed by scientists to better understand an ecosystem in its entirety, meaning we can make better decisions about an area's management as well as its protection. The remotely operated vehicle Deep Discoverer being prepared for launch during a dive for the Windows to the Deep 2018 expedition. Image courtesy of Art Howard, GFOE, Windows to the Deep 2018. Download larger version (jpg, 9.9 MB). ROV Deep Discoverer documents the benthic communities at Paganini Seamount during the Deep-Sea Symphony: Exploring the Musicians Seamounts expedition. Image courtesy of the NOAA Office of Ocean Exploration and Research, Deep-Sea Symphony: Exploring the Musicians Seamounts. Download larger version (jpg, 1.0 MB).